Madikizela-Mandela casket arrives at Orlando Stadium - SABC News - Breaking news, special reports, world, business, sport coverage of all South African current events. Africa's news leader. The casket is draped in the South African flag, a reflection of a country united in grief for the "mother of the nation." The casket of Winnie Madikizela Mandela has just arrived at the Orlando Stadium in Soweto accompanied by her family. 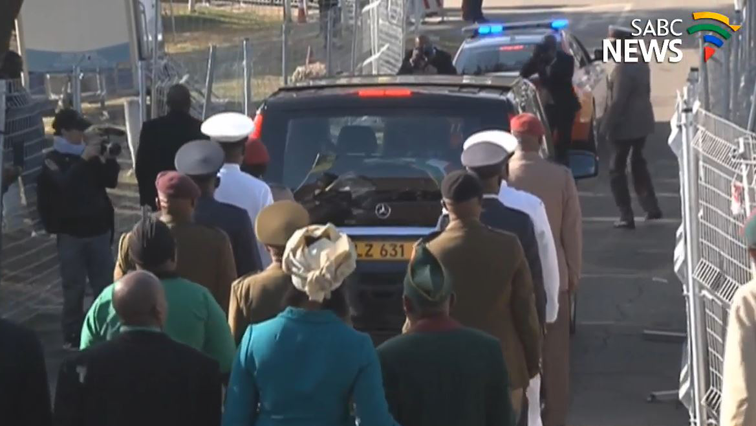 She was carried by the same military hearse that was used for former President Nelson Mandela’s funeral in 2013. A hush fell over the thousands of morners at the stadium as visuals of the hearse and the family making the short journey from the home to the stadium were broadcast on the large screens flanking the main podium. Although the event is a sobre one, an air of celebration is also evident. The half full stadium is dominated by the green, gold and black of the African National Congress members who are sitting side by side and singing struggle songs together with members of the Economic Freedom Fighters in their signature deep red attire. With the stadium rapidly filling up its expected that it may reach it 40 000 capacity. Proceedings are expected to get underway shortly with a welcome address by Gauteng Premier David Makhura.